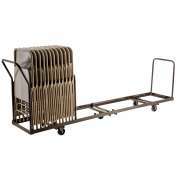 Chair Dollies & Carts In a Great Selection of Styles: Shop Now! 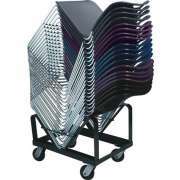 Whether you need to stack, store, or move a high volume of chairs, our chair dollies present the optimal solution. Make sure that you choose a model that will fit well in your storage space and can support the kind of seating you have. Need to move tables around with your chairs? 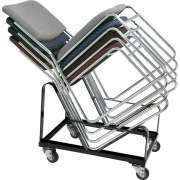 We even offer chair trucks that can accommodate tables as well. What is the fastest way to move chairs? 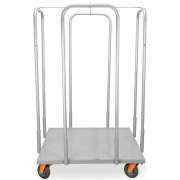 Our chair carts and dollies are designed to be used repeatedly on a daily basis. They are easy to maneuver and maintain. Give your staff a break and reduce labor costs by having a chair dolly around the next time you have to set up a big event. 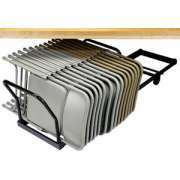 How can I save time when setting up folding chairs? 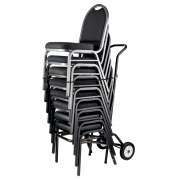 Lugging folding chairs and stacking chairs around takes a lot of effort and can put a considerable strain on the body. When seating has to be manually carried from room to room, setup can take hours and be thoroughly exhausting. It is worth investing in something that can speed up the process of setup and cleanup, because in the end this will save time and manpower. A chair truck is just what you need to move around all of your temporary seating. With many chairs stacked or lined up on one mobile unit, everything can be moved into position in one trip, and all that is left to do is set up seating in the desired arrangement. Hertz Furniture offers chair caddies in a selection of styles and arrangements so you can choose the model that best suits your seating and storage space. How do I choose a chair dolly? 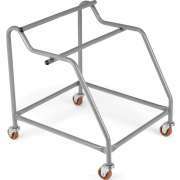 For those who are purchasing chair dollies along with their folding chairs or stack chairs, we have a number of carts that are designed for particular chair models. Even if you have already chosen your seating, it is important to make sure that the caddy selection can support the style and capacity you need. Having a Read Across America Day event? Hosting a large wedding? Giving a parent info session about STEM education? 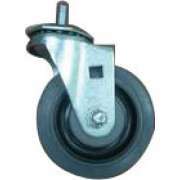 There are chair trucks which are model-specific, as well as universal carts, that can help you set everything up as quickly and efficiently as possible. 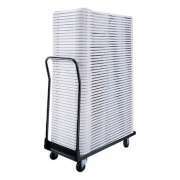 What are the different kinds of chair carts? 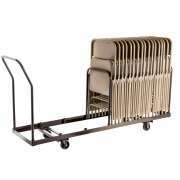 There are lots of factors that distinguish different types of carts for chairs. 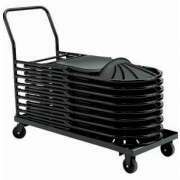 After verifying that a storage capacity and model will fulfill your needs, it is a good idea to ensure that the cart is easy to push and maneuver. 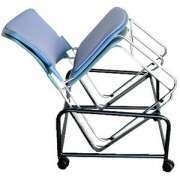 Some models are designed as rolling platforms which chairs are placed on, but don&apos;t necessarily have separate handles. This design might work if chairs just need to be moved across the room, but if they have to travel longer distances, it will be easier to steer with a handle at an appropriate height. 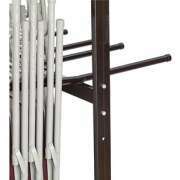 Some high-capacity folding chair racks even feature adjustable handles which hold chairs in place even when the cart is not stocked to full capacity. 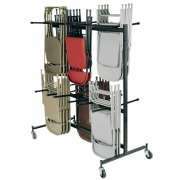 Chair caddies come in various configurations. The ideal style depends on where they are going to be kept, how many chairs need to be moved, and how far they are going to travel. 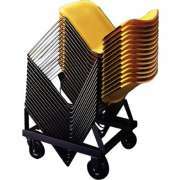 Compact folding chair carts models on which chairs are hung conserve floor space but can be challenging for one person to steer independently. 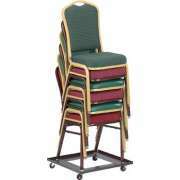 There are also high-capacity caddies which support long rows of chairs. This design ensures that someone who is steering the cart can easily see over the contents, but it also takes up a significant amount of floor space. 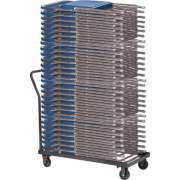 Are there special carts for stacking chairs or high capacity? When setting up for a banquet, production or other formal event, it is always helpful to have a convenient way to move chairs around. Stacking chairs are easy to transport because they can simply be stacked on an appropriate chair dolly and rolled away in a neat pile. 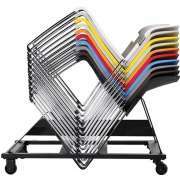 This design doesn&apos;t take up extra space in storage and ensures that chairs are ready to go at a moment&apos;s notice. Sometimes special events and situations necessitate particular models. 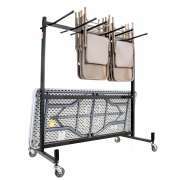 Double-wide chair dollies have an incredibly high capacity which enables all seating that is needed for large events to be moved in one easy trip. This arrangement is perfect for outdoor ceremonies or setting up a gym or social hall as a temporary performance space. When both tables and chairs are needed for an expo or seminar, you can still enjoy the convenience of transporting everything in one trip. Our combination chair caddies and table carts enable all necessary furniture to be moved together. Hertz Furniture&apos;s chair trucks are built for convenience and durability. 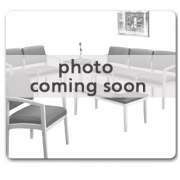 They come from reliable manufacturers including National Public Seating, OFM and Huffman Welding. When choosing between the models, be sure to verify that your chair cart of choice will fit the seating you have. If you need help figuring out how to match up capacity, model and style to suit your needs, contact the Project Solutions team for free project-planning advice.